NEW BRITAIN – As a kid, longtime Hartford firefighter Raul Ortiz always wanted to be fire chief or mayor, his aunt Maria Martinez said. 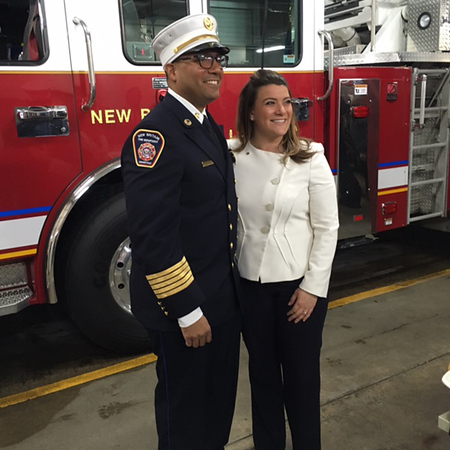 The 43-year-old Ortiz made history Monday morning as he was sworn in by Mayor Erin Stewart as the city’s first Hispanic Fire Chief. Monday evening he was introduced to residents during a meet and greet at New Britain High School. He’ll spend the next couple of weeks talking with firefighters to get a sense of the issues that have plagued the department in recent years and led to an investigation last year of possible racism. Ortiz started as a Hartford firefighter in 1999. He served as a lieutenant from 2010 to 2016 and later served as an Executive Officer, Public Information Officer and Deputy Chief. Posted in New Britain Herald, General News on Monday, 16 April 2018 16:56. Updated: Monday, 16 April 2018 16:59.